First was a Chateau Les Trois Croix 2004, that when opened offered zero aroma on the cork and very little in the glass. This wine had moved well on from the fruity stage and contained strong savoury flavours. Vegetable taste elements abounded from broccoli to asparagus that matched perfectly with the dry spice and vegetable flavours in the curries. 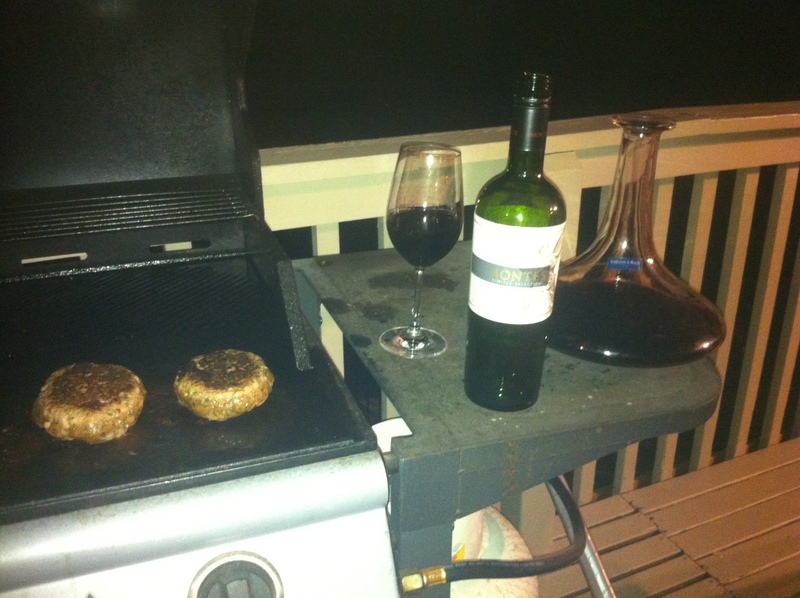 Second was a Chilean drop, Montes Limited Selection Cabernet Carmenère 2011. This is a blend of Cabernet Sauvignon (70%) and Carmenère, the latter grape offering up a lovely spicy finish that complemented the curries. You can currently pick this up at Dan Murphy’s and it’s great value for money. I find that a food and wine matching requires either a stark flavour contrast, or alternatively something in common that connects the food to the wine. In both these cases there was a savoury and spicy element in the wine that made the association. There is no right and wrong with food and wine matching, but in this case we got it right. Restaurant definitely worth a visit, curries very mild, very good service. I’ve had both these wines again recently and Neal has given me the ok to update this post. Second time around and the 2011 Montes Limited Selection Limited Cabernet Carménère was even more enjoyable than when I had it with Neal at the Afghan restaurant. It’s plain and simply a delicious red wine that lasted in the mouth for quite some time, with a long list of flavours like cinnamon scrolls, cayenne pepper, chocolate, vanilla, blueberry and cherries, with a wild scent to go with all of this. All nice and smooth… totally in balance. At $15 per bottle from Dan Murphy’s it is one of the best bargains going. Not only is it great now but this wine would go down for quite a few years. It’s widely available around the world too. I’m stoked my wife bought me a few bottles of this on Neal’s recommendation. I’ve got a couple more still to enjoy. If I didn’t have any left I think I’d buy a whole case for that price! Neal is a Carmenere fan and he has me converted! 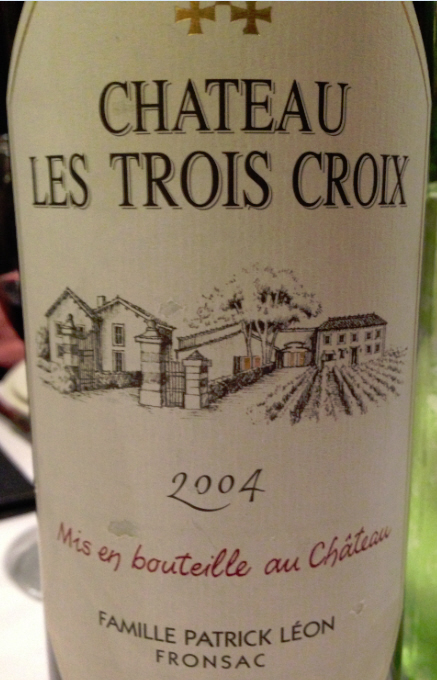 The 2004 Chateau Les Trois Croix was also better second time around. I am so glad this Bordeaux turned out to be quite enjoyable because both Stuart and I have had a bad run of French wine lately. I was starting to think you could only enjoy good French wine if you paid through the nose so I’m glad that it doesn’t always have to be the case. We noticed in the restaurant that it took a while to open up so I decanted this one for an hour or so. Being primarily Merlot driven it is quite a soft wine but it really did open up! Still earthy and gamy like the first time but there was loads more juicy fruit. Yummo! Although the 2004 may be hard to come by, I won a few bottles at auction for about $25/bottle, the 2009 Chateau Les Trois Croix is available in Australia online from Cloudwine Cellars and various vintages are quite readily available around the world and would be worth a go for sure, especially considering decent Bordeaux is hard to come by at this price! Both wines definitely confirmed themselves as great red wines for spicy food, especially the Cabernet Carménère as it actually tastes spicy. The soft and subtle style of the Chateau Les Trois Croix works too. Just shows that you don’t have to limit yourself to whites when enjoying spice. That was a great little restaurant and the wine went quite well, all quite unexpected. I was glad to have been invited along too. It’s always hard to match wine with hot Indian dishes but the Afghan food, although similarly named to Indian dishes, was actually far more mild with the chilli and a little sweeter too, due to the addition of a little bit of honey in some dishes, as we found out. I brought the Chateau Les Trois Croix along and Neal brought the Montes. It was only by luck that mine went well with the food. Neal’s choice was by design. I found that the Chateau Les Trois Croix had almost no scent whatsoever initially but did open up into a light red wine that just happened to sit well with the Afghan. To me, it was the sort of wine someone new to red wine would enjoy and call “easy drinking”. The Montes, on the other hand, had a strong spicy element to it and a lot more fruit. Not a heavy wine either, but it definitely had some body. I came away glad to have discovered a couple of reds that go well with a bit of spice, especially the Montes. The blend of Cabernet and Carmenere had interesting flavours and texture and the story of the Carmenere grape is just as intriguing. These sound very good, almost tempting for me to try them. I am glad to hear about that restaurant. We have one here in SoCal and it is very good, but they don’t allow alcoholic beverages at all. Nice little vignette. That sounds like a very strict adherence going on there, but so be it if the food is good. The non-meat Afghan dishes are divine! I’d eat them every day. Me too! Love Afghan, Ethiopian, most Asian food. Our Afghan place has meat and non-meat dishes. It still must be tough to drink wine with hot food! Back home when I was eating couscous I once found a Morocccan restaurant which served Moroccan Pinot Gris. The answer? That may be the answer if you want to drink a white wine with hot food, but I’d probably go a mid-dry Riesling or Gewürztraminer. (Someone else suggested the same wine in a comment below, it sounds like a good match for Moroccan style spice). The Moroccan restaurants, which abound in this area, serve a good Moroccan rose ( very pale, like a gris) called Boulaouane. Works very well with tagines and couscous. dragonlife above mentioned the same wine with Moroccan spice. You’ve both pricked my ears up and I think I may well have just received a good wine tip that I will have to try. Thanks! Chocolate flavor in wine? how does it taste like? Sounds very intriguing and similar to a very nice Lebanese wine (http://www.chateaumusar.com) – any thoughts on that one? We love spicy food over here at the cave, but found that the only drink able to cope with spicy Asian food is beer. Which is also very appreciated. I’m yet to try any wines from the Bekaa Valley but they are definitely on my “must do” list. That’s the thing about being a wine wanker, you are always discovering new things in wine no matter how much you’ve already discovered. Thanks for the tip! Since I have a housemate from Aghanistan that also cooks once a week, this is some valid info! Thanks guys! Lucky you! Give these a go, you should be able to source either of them in your neck of the woods, and if not, you can always try another Chilean Carmenere based wine or just be safe and go a Riesling from over your way. Intriguing–around here most people think of white wines (either on the astringent side or spicy/sweet) or beer to eat with spicy foods, so I’m not as accustomed to sussing out which reds would suit. Those you describe sound like a good match for any sort of hearty spice, not least of all the ubiquitous Texas chili dishes! Yeah, that’s the thing. Most people don’t associate red wine with spice but now that you guys are coming into winter it’s the perfect match, although Texan chilli dishes will be a real test. These ones you should be able to find fairly easily up your way, especially the Cabernet Carmenere or at least another Carmenere based wine for Chile. Thank you for these wonderful recommendations! I do enjoy Carmenere, and I’ll have to give it a whirl the next time we get something spicy and curried. My head would have pointed me to a white with a tiny bit of residual sugar, but your experience begs for me to give the Carmenere a try. I mentioned in another comment below that it may have been the sweeter and less hot nature of the Afghan food that made it all work but I’d still definitely give Carmenere a go with other spice. Also, see what I said here … http://thewinewankers.com.au/2013/08/10/pairing-a-2008-frogmore-creek-riesling-with-indian/ Good luck! I’m learning so much by reading your blog! I’ve never been much of a wine-drinker, but I appreciate hearing your descriptions and recommendations! Thanks Debbie, I’m glad you still get something out of it all. Cheers! Hey, Conrad, I’m so glad you’re getting a kick out of my cartoons & illustrations. That’s the fun; thinking something’s funny in the wine world and making other people snort as well. I read this post with interest because I’ve never had any luck on my palate with ‘hot’ or ‘hottish’ spice and reds. I guess from your post that Afghan food isn’t simply hot-spicy but more complex, but I know I’d run straight to a chilled white. I’ve wrecked a few too many nice reds (though nothing pricey, haha) as a result of my own palate clash. That said, I love Carmenere (all that yummy herbaceousness and savoury-spicy-veggie-stuff going on) and love to hear about how other people like it, too. Love my curries being a northern lad, it’s always a good laugh trying to pair them up. You’d have some awesome curries to try and put wines up against! Thanks for the tip on dry Rieslings. We are quite spoiled for them down here. I also find that the Austrians make some great off-dry Rieslings nowadays too. A wine from the Libourne region goes well with this type of food, I’m sure. You got me with this lovely picture of the French bottle. A French native turned Californian can only melt with such a blog. And thank you so much for coming by! We can be pretty slow at writing too so it should work out well for you! 😉 Thanks for popping in! !